This photograph was taken by Cliff Paterson on Jurayd Island, one of the Saudi Arabain Arabian Gulf coral islands. Cliff has kindly allowed me to use the photo on my website which is shown below. Green turtles are the largest of all the hard-shelled sea turtles and can weigh up to 150 kilograms and measure one metre long. They have a comparatively small head. Adult green turtles are unique among sea turtles in that they eat only plants; they are herbivorous, feeding primarily on seagrasses and algae and this diet is thought to give them greenish-colored fat, from which they take their name. The carapace is smooth with shades of black, gray, green, brown, and yellow; their bottom shell, or plastron is yellowish white. Females return to the same beaches where they were born every 2-4 years to lay eggs, generally in the summer months between June and September. During the nesting season, females nest at approximately two-week intervals. They lay a number of nests with up to 150 eggs in each which will incubate for approximately 2 months before hatching. Adult females migrate from foraging areas to mainland or island nesting beaches and may travel hundreds or thousands of kilometers each way. 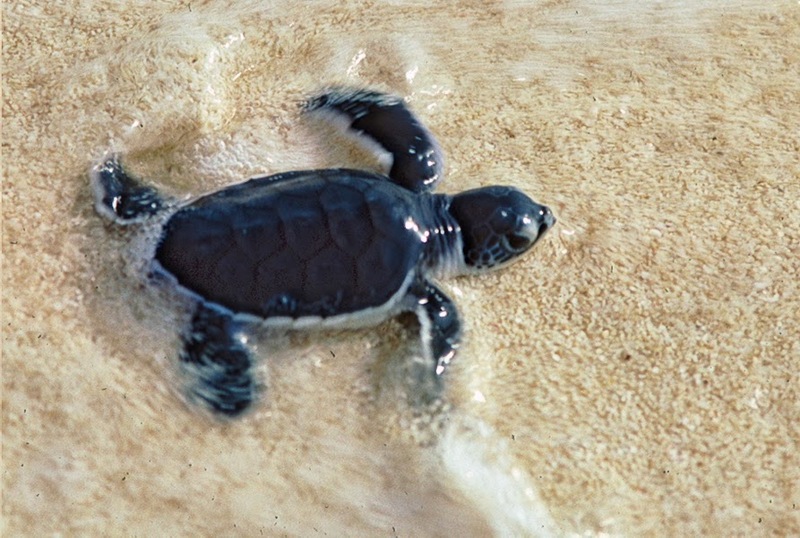 After emerging from the nest, hatchlings swim to offshore areas, where they are believed to live for several years, feeding close to the surface on a variety of pelagic plants and animals. Once the juveniles reach a certain age/size range, they leave the pelagic habitat and travel to near shore foraging grounds. Once they move to these near shore benthic habitats, adult green turtles are almost exclusively herbivores, feeding on sea grasses and algae.